Globally, musculoskeletal disorder (MSD) is the single largest cause of work-related illness, accounting for over 33% of all newly reported occupational illnesses in the general population and 77% in the construction workers. Musculoskeletal disorders not only hamper productivity at work, they are also the leading cause of sickness absenteeism, days of work lost, and disability. The etiological factors playing a role in the occurrence of this condition run a gamut from poor working conditions, lack of adequate training, poor physical postures, prolonged working hours with inadequate rest periods in between, and psychosocial factors such as support from co-workers and supervisors, as well as other factors such as job pace and job monotony. Musculoskeletal disorders have an impact on all dimensions of health, both through direct and indirect mechanisms. The impact on the physical dimension of health with physical injuries, delayed healing due to the repetitive nature of the injuries, and lost workdays, which thereby impact the other dimensions of health including mental health and thereby the social and emotional dimensions as well. There are indirect implications on the socioeconomic status due to lost work, sickness absenteeism, healthcare costs, and even hospitalization in some workers. In spite of the high prevalence and wider range of adverse consequences, the studies highlighting the burden and impact of musculoskeletal morbidities are very scarce in India. The current study is aimed at filling this vital gap in the knowledge regarding this important occupational disease in the country as well as to suggest appropriate preventive measures. To analyze the factors influencing the occurrence of musculoskeletal morbidity in the study group. The study was conducted in Old Mahabalipuram Road of Chennai metropolitan City, where there is a high density of construction establishments. The study population was the representative sample of construction workers, living in a suburban area of Chennai Metropolitan city. People working in the construction field for at least 1 year were included in the study. The sample size was calculated considering the prevalence of musculoskeletal morbidity in the group to be ~20%.,, With 5% allowable error and 95% confidence level (CI), the required sample size was 245. To facilitate the subgroup analysis and to account for refusal to participate, it was decided to include approximately 300 individuals in the final study. Any living congregation of construction workers accommodating more than 100 people was considered to be a study unit. Approximately 50 such study units were identified and a serial number was allotted to each of them. By using simple random sampling, 10 study units were selected to be included in the final study. Approximately 30 participants were selected from each of the study units by simple random sampling after allotting serial numbers to the residents. Thus, the sampling method used was multistage simple random sampling. Musculoskeletal morbidity was assessed by Modified Nordisk Scale, which is a structured and validated tool and has been used widely across various settings. Sociodemographic and occupation-related information was collected by a pretested, structured questionnaire. Reference and recall periods were considered, as advocated by the modified Nordisk Scale. Approval of the Institute's Human Ethics Committee, Chettinad Hospital and Research Institute was obtained. Informed consent was obtained from all the study participants after thoroughly explaining the nature and purpose of the study. 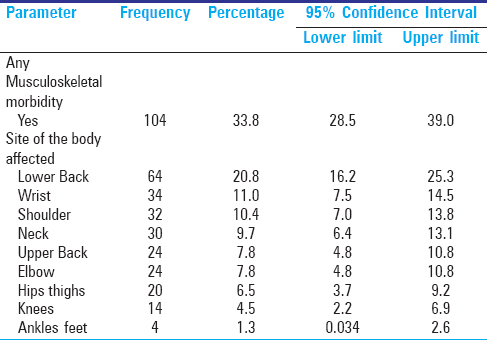 Occurrence of any musculoskeletal morbidity, as per the modified Nordisk scale was considered to be the primary outcome parameter. Various sociodemographic variables such as age, gender, etc., and work related variables such as duration of work, time since working in construction field, nature of activity, etc., were considered as explanatory variables. Variables in categorical/dichotomous were presented as frequencies along with their percentages. Quantitative variables were presented as mean and standard deviation. The association between explanatory and outcome variables was assessed by univariate logistic regression analysis. Multivariable logistic regression analysis included all the statistically significant associations in the equation. The odds ratios and their 95% CI were presented along with the P values. Statistical Package for the Social Sciences (SPSS; IBM) version 21 was used for data analysis. A total of 308 participants were included in the study. Majority (66.2%) of the study participants belonged to the 21–40 years age group. The proportion of participants below 20 years was 22.1%. Males constituted 282 (91.6%) study participants. Mason and labourer/porter were the two most common occupational groups, constituting 113 (36.7%) and 111 (36%) participants, respectively. Carpenter, plumber, and painter were the other common occupational groups. Majority of the study participants recently entered into the occupation, as 217 (71.4%) participants reported working for less than 5 years in the occupation. Only 28 (9.1%) of the study participants were working for more than 10 years. The duration of work was 8 hours in a majority (71.4%) of the study participants. The number of persons, who were working beyond 10 hours a day, was 60 (19.5%) [Table 1]. The prevalence of musculoskeletal morbidity was 33.8% in the study population. The three most common sites affected were the lower back (20.8%) (CI: 16.2–25.3), wrist (11%) (CI: 7.5–14.5), and shoulder (10.4%) (CI: 7–13.8). Neck, upper back, elbow, and hips and thighs were the other common sites affected [Table 2]. In the upper limbs, majority of the participants reported the involvement of the right side. However, in the shoulders and lower limbs, majority of the participants reported involvement of both the sides of the body [Table 3]. The percentage of participants having pain for more than 30 days was 16.9% (CI: 12.7–21.1). Some (4.5%) of them even changed jobs/duties due to WMSD (CI: 2.2–6.9). The proportion of study participants hospitalized due to pain was 7.8% (CI: 4.8–10.8). Number of workers prevented from doing normal work during the last 12 months were 10 (CI: 1.3–5.2) [Table 4]. Compared to people below 20 years of age, people who are aged between 20 to 40 years had 3.20 times (OR: 3.206; CI: 1.545–6.653) and people aged 41 years and above had 2.72 times (OR: 2.72, CI: 0.99–7.47) more risk of musculoskeletal morbidity. Based on the nature of the work, labourers had 4.438 times (OR: 4.438; CI: 1.615–12.19) more risk of WMSD compared to other works. Participants working for more than 11 years had 2.778 times (OR: 2.778; CI: 1.129–6.835) more risk of musculoskeletal morbidity after controlling for other potential confounders. 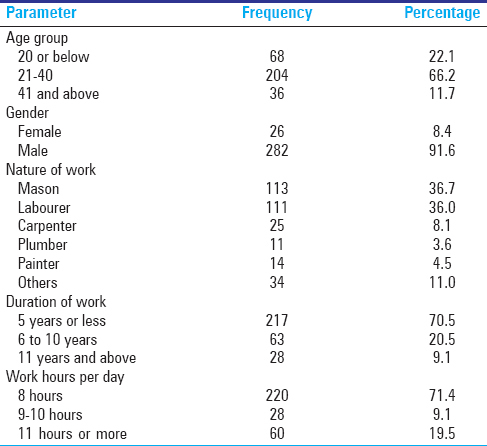 However, gender of the person and work hours per day had no significant association with occurrence of musculoskeletal morbidity [Table 5]. The multifactorial nature of MSDs requires a discussion of individual factors that have been studied to determine their association with or influence the incidence and prevalence of work-related MSDs. These factors include age, gender, occupation, physical activity, duration of work, and work hours per day. The overall prevalence rate of WMSDs was 33.8%, and was associated with individual and workplace-related risk factors. Further, 27.9% of the participants experienced symptoms of WMSDs in the upper body, including the neck, whereas 20.8% had symptoms in the lower body, and 11.8% had symptoms at the wrist joints. All these values are consistent with the previously documented prevalence of 20–63%,,, although the exact prevalence may vary with respect to country, state, and locality, and even between studies in the same locality. The current study reveals that, there were more male than female workers who participated in this study [Table 1]; the mean age ranged 21–40 years. Most participants (80%) had less than 20 years of experience. Seventy-one percent of the workers worked 40 hours a week or more. The prevalence of lower back WMSDs was significantly associated with participant age. In this study, more than 60% of the participants between the ages of 20 and 40 years had WMSD complaints, whereas only 10% of those older than 40 years did. 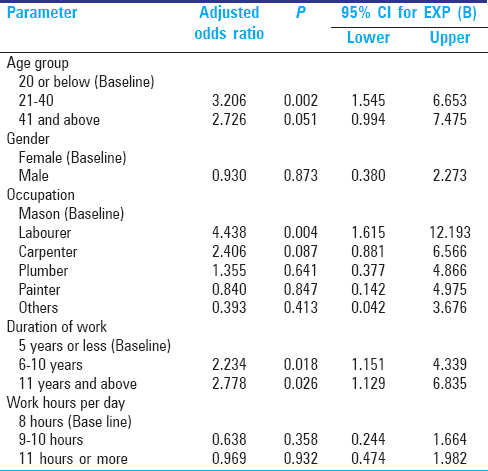 This association between age and WMSD complaints has also been reported in previous studies.,,,, The high prevalence of lower back complaints among young age group could be associated with a lack of professional experience, knowledge, and skills., Higher work load could be another explanation for the higher prevalence of low back complaints in young construction workers. However, moving out of direct contact and into administrative positions, which are less physically demanding, could explain the lower prevalence of lower back complaints in our study's older age group. The most common health problems included back or shoulder problems followed by neck. Holstorm et al. who studied MSDs among construction workers in Scandinavia implicated physical risk factors such as awkward posture and associated psychosocial factors. This is consistent with the situation in construction workers in India who often work for prolonged hours with improper loads in awkward positions due to lack of ergonomic training. Our results show that the prevalence of musculoskeletal symptoms was high in workers with repetitive movements, prolonged working hours, inadequate rests and awkward postures were especially hazardous when they involved the same joints and muscle groups and when workers did the same motion too often, too quickly, and for too long. Silverstein et al. found that workers in high-repetition/low-force jobs had a threefold greater risk of cumulative trauma disorders of the hand and wrist than workers in low-repetition/low-force jobs. Both static posture and repetition can produce injury when there is no break from muscle contraction. Several studies showed that awkward postures, work at shoulder level; heavy lifting and repetitive hand and wrist movement contributed to the development of disorders of the neck and upper limbs., Some work-related activities such as repetitive movements and heavy lifting with awkward postures were previously identified as risk factors for musculoskeletal pain. Similarly, employment status, job experience, and skills were significantly associated with increased prevalence of WMSDs. Our findings also showed that construction workers with WMSDs experienced symptoms in virtually all anatomical areas, as did Eva et al., and that the part of the body affected had a considerable work-related component. Consistent with previous studies and global trends,, bricklayers recorded the highest prevalence of upper limb disorders (58.2%), followed by electricians (55.8%), ironworkers (55.7%), and carpenters (46.2%). Common features among construction workers in these trades are the intense involvement of muscles and other musculoskeletal structures of the upper body. Structures such as the deltoid muscle, rhomboid major and minor, trapezium, pectoral muscles, scapular, clavicle, and other structures around the shoulder, elbow, and wrist joints are often poorly and abnormally utilized. This is because workers in these trades are often seen using machines (drilling, vibrating, cutting, welding, and melting) in awkward positions and directions, which leads to increasing unilateral and unequal stress on selected parts of these structures. Such interactions have been shown to be associated with high prevalence of WMSDs of the upper body segment. MSDs represent a large burden of disease among construction workers and cause significant impairment in physical and mental health along with limitation in daily activities. There were three key findings in our study: (1) 1-year prevalence of WMSDs among workers was common, with the lower back being the most affected. This was followed by shoulder, neck, upper back, shoulder, hand/wrist, knee, ankle/foot, elbow, and hip/thigh areas; (2) WMSDs were related to the participant's demographic, work settings, duration of work; and (3) work duties and normal activities were affected by MSDs. These findings underline the importance of having WMSDs education and prevention programs in India. The availability of and early access to treatment and prevention programs may prove effective in reducing these injuries. Avoid musculoskeletal disorder (MSD) risks; evaluate MSD risks that cannot be avoided; combat MSD risks at source; adapt the work to the individual (e.g., by providing suitable tools and equipment and improving workstations); develop a coherent overall prevention policy (including health surveillance, medical treatment and rehabilitation where necessary); collective prevention measures should take priority over individual protective measures; and appropriate instruction and training should be given to workers. Participate in ergonomic training. Use ergonomic assistive devices if available. Products such as slip sheets, slide boards, rollers, slings, belts, and mechanical or electronic hoists have been designed to help the workers. They should include employer commitment of time, personnel, and resources; someone should be in charge of the program who is authorized to make decisions; a system to identify and analyze risk factors; worker and management training; medical care for injured workers; maintaining good injury records; regular evaluation of the program; and effective education. Tiwary G, Gangopadhyay PK. A review on the occupational health and social security of unorganized workers in the construction industry. Ind J Occup Environ Health Med 2011;15:18-24. Baruah B. Gender and globalization; opportunities and constraints faced by women in the construction industry in India. Labour Stud J 2008;35:1-24. Ramesh PB. Rethinking Social Protection for India's Working Poor in the Unorganised Sector. Cross National Policy Exchange: Asia Social Protection Papers; 2009. p. 1-18. Rajasekhar D, Suchitra JY, Madheswaran S, Karanath GK. At times when limbs may fail: Social Security for Unorganised workers in Karnataka. Karmayoga 2009:1-32. Sameer V, Surendranath Sai. Impact of musculoskeletal disorders and social determinants on health in construction workers. Int J Biol Med Res 2012;3:1727-30. Wu S, He L, Li J, Wang J, Wang S. Visual display terminal use increases the prevalence and risk of work related musculoskeletal disorders among Chinese office workers: A cross-sectional study. J Occup Health 2012;54:34-43. Welch LS, Hunting KL, Nessel-Stephens L. Chronic symptoms in construction workers treated for musculoskeletal injuries. Am J Ind Med 1999;36:532-40. Ortiz-Hernández L, Tamez-Gonalez S, Marténez-Alcántara S, Míndez-Ramirez I. Computer use increases the risk of musculoskeletal disorders among newspaper office workers. Arch Med Res 2003;34:331-42. Punnett L, Wegman DH. Work-related musculoskeletal disorders: The epidemiologic evidence and the debate. J Electromyogr Kinesiol 2010;14:13-23. Descatha A, Roquelaure Y, Chastang JF, Evanoff B, Melchior M, Mariot C, et al. Validity of Nordic-style questionnaires in the surveillance of upper-limb work-related musculoskeletal disorders. Scand J Work Environ Health 2007;33:58-65. Bernard BP. Department of Health and Human Services, National Institute of Occupational Safety and Health. Musculoskeletal Disorders (MSDs) and Workplace Factors: A Critical Review of Epidemiologic Evidence for Work-related Musculoskeletal Disorders of the Neck, Upper Extremity, and Low Back. Washington, DC: [DHHS (NIOSH)]; 1997. p. 97-141. Centers for Disease Control and Prevention. Measuring Healthy Days. Atlanta, Georgia: CDC, 2000. Kourinka I, Jonsson B, Kilbom Å, Vinterberg H, Biering-Sørensen F, Andersson G, et al. Standardised Nordic questionnaires for the analysis of musculoskeletal symptoms. Appl Ergon 1987;18:233-7. Simcox N, Flanagan ME, Camp J, Spielholz P, Snyder K. Musculoskeletal risks in Washington State apple packing companies. Seattle, USA: University of Washington, Department of Environmental Health; 2001. Available from: http://depts.washington.edu/frcg/content/applepacking.pdf. [Last accessed on June 11, 2008]. AnnualReport of Ministry of Labour for the year 2013-14. Available from: http://labour.nic.in/annrep/annrep2014.htm. [Last accessed on 2015 Aug 31]. Alrowayeh HN, Alshatti TA, Aljadi SH, Fares M, Alshamire MM, Alwazan SS. Prevalence, characteristics, and impacts of work-related musculoskeletal disorders: A survey among physical therapists in the State of Kuwait. BMC Musculoskeletal Disorders. 2010;11:116. doi:10.1186/1471-2474-11-116. Engholm G, Holmström E. Dose-response associations between musculoskeletal disorders and physical and psychosocial factors among construction workers. Scand J Work Environ Health 2005;31(Suppl 2):5767. Silverstein B, Fine LJ, Armstrong TJ. Occupational factors and carpal tunnel syndrome. Am J Ind Med 1986;11:343-58. Putz-Anderson V. Cumulative trauma disorders–A manual for musculoskeletal diseases of the upper limbs. London, UK: Taylor & Francis; 1988. Eva V, Lars A, Evy F, Christer H. Disability pensions due to musculoskeletal disorders among men in heavy occupations. A case control study. Scand J Soc Med 1992;20:31-6. Rwamamara RA. Successful strategies for the prevention of work-related musculoskele tal disorders among Swedish construction workers. In: Pikaar RN, Koningsveld EAP, Settels PJM, editors. Proceedings of the 16th Congress of the International Ergonomics Association [CD]. Amsterdam, The Netherlands: Elsevier; 2006. Kaminskas KA, Antanaitis J. A cross-sectional survey of construction workers: An ergonomic approach. In: The 10th International Conference on Modern Building Materials, Structures and Techniques. Vilnius, Lithuania: Vilnius Gediminas Technical University; 2010. p. 1246–52. Available from: http://dspace.vgtu.lt/bitstream/1/495/1/1246-1252_kaminskas_antanaitis.pdf. [Last accessed on June 25, 2014]. Schneider SP. Musculoskeletal injuries in construction: A review of the literature. Appl Occup Environ Hyg 2001;16:1056-64.